Soldiers. Budding young men in uniform. Everywhere. On the bus, in the mall, hanging out at the coffee shops. One of the initial sights that an Oleh needs to get used to is our ever present soldiers and their guns slung over their shoulders. 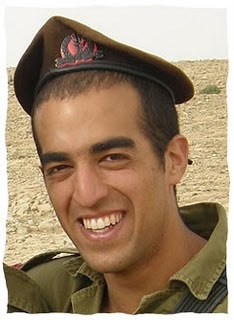 Their army duty is a necessity and part of the fiber of living in Israel. Would that life were such for them, as in other countries, they could be in college, or working at a hamburger joint and whiling away the hours playing computer games and going out on dates. But, until a time in the future, this is their lot in life. And for the most part, they embrace the opportunity. And their parents and neighbors and family pray for them in earnest. For their physical, spiritual and emotional safety. In the war with Gaza, many of those prayers were answered.Today's blog is a video that gives credit to those answered prayers.This video is a testimony to the G-d who is with us. And if G-d be for us, who can be against us? There is nothing more heart-wrenching than seeing someone, young of age and shorn of their destiny, losing their life. Sadly, Israel, knows far too much about this. During the callous, heartless years of 1940's Europe some 1,500,000 children lost their right to life. Such huge a number the human mind can scarce comprehend; yet a display at Yad Vashem, featuring one toddler's fading shoe with that grotesque number written underneath captured the enormity of that number by focussing on one child's single shoe. The satanic spirit of anti-semitism that reared it's ugly head in the Holocaust still wages war against the people of this tiny land of Israel. I have not forgotten the appalling murder of dear, 5 month-old, Yehuda Chaim Shoham as he travelled in the car of his parent’s. A boulder, thrown by Arabs, pierced the car's windscreen and inflicted mortal injuries to a life that had barely started. The anguish and anger of the parents (no! the whole Jewish nation) and the abhorrence toward anyone who could act against anyone, let alone a dear 5 month-old baby, like this still hurts my heart. Again, it is only in the pain of the one that the numbers who have lost their lives in this second holocaust can be grasped. The peace that has generally been seen in Europe has not been felt by Israel as the battle for mere survival continues. One more year at Yad Vashem, I remember another image that refuses to leave my mind: a young female school-teacher, perhaps 25 yrs old, with her class of pupils gathered around her, under the shade of a tree, to listen to her words about the righteous among the nations, still ‘wore’ a machine gun over her slim shoulders. What have we come to when teachers can’t even teach without the necessity of guns? As we have seen, the LORD is He who delivers His own and judges His enemy. But until there is no more war, brave young men and women must serve in the military, with all that that entails. Looking repeatedly into the faces of those who are called to carry a gun, what never fails to amaze me is, on the one hand is how young these soldiers of peace really are; and on the other how mature they are as they discharge their duties. Then coming back to Britain, once more, I am horrified at the dishevelled and unruly nature of much of our youth. Give many of our British youth a machine gun and there would be carnage. In Britain we have a saying: ‘Every cloud has a silver lining.’ If we look hard enough, no matter how black the days, there is always something that redeems it. Dear inhabitants of Eretz Yisrael, even in these awful days there is something to be thankful for. As we look to the nation’s young people, be thankful for the LORD is indeed performing a miracle in them. The following song, ‘Now be Thankful,’ played by the secular folk-rock group Fairport Convention (vocalist: Dave Swarbrick) in 1970 focuses on this very point.